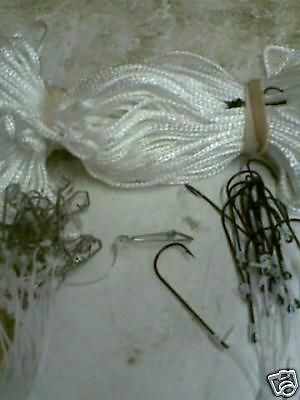 This is a handmade,new and unused Longline or Trot line approx 200ft long and there is a loop at either end of the line for fixing to a weight or anchor. It is made from 3mm rotproof braid so will not twist. The hooks are 2/0 Aberdeen long shank. It is water and U.V. resistant so can be kept in damp or wet conditions as it will not rot. The 30 hooks are tied approx 2m (6ft) apart to 1mm thick 3 ply rotproof twine for extra strength. There is a spring clip on each hook length for easy removal when taking fish off. Ideal for Cod,Bass,Dogfish,Plaice and most bottom feeding seafish. and set between 2 weights/stakes or it can be used from a boat.